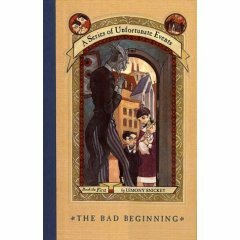 A Bad Beginning (A Series of Unfortunate Events, Book1) by Lemony Snicket really got my gander up. I wanted to read it to see what all the hoopla was about, given the release of the movie. Not being a Jim Carrey fan, I really wasn't very into the books just because of the actor who was selected to portray one of the main characters in the book! That fact along spoke volumes to me. However, not wanting to rain on the parade of a book I hadn't even read, I figured I should give it a chance and see what The Big Deal was. I have to say that I pretty much hated the book. Ok. I really hated the book. I think I hate it in part because of the time I spent working in law and, more specifically, in a District Attorney's office. There were several themes and topics within this book that I thought were rather shockingly inappropriate for the age group which this book is recommended for (9-12). In order to secure the fortune of the children, Count Olaf, who is himself something of a thespian, devises a plan in which he will marry the oldest Baudelaire girl, Violet, on stage. He somehow convinces his next door neighbor, a high court judge, to perform the marriage ceremony on stage by telling her to perform an actual ceremony in order to make the "play" marriage official and real which would then give him control of the money. What I find ENTIRELY disturbing is the fact that Count Olaf, apart from being the children's legal guardian and quite obviously very old, is attempting to force a 14 year old to marry him. Once she realizes what Olaf's true scheme is, Violet has to make a decision over whether or not she will marry him, or refuse whereupon he threatens to kill their youngest sister. She imagines what life would be "lying in bed" beside him. I find this entirely inappropriate and disgusting by itself. Let alone as a subject matter included for younger children. Also, the Baudelair boy, Klaus, who is a bibliophile, takes up reading some of the judge's law books in an effort to find a way to stop Olaf from being able to force Violet into a marriage. For some unexplainable reason Klaus brings up the subject of polygamy. It isn't entirely clear why. Just a random topic in the grand scheme of things. I frankly don't see the reason for such topics being included in a children's book. I'm not interested in sheltering children from the world by any means. I think that there is a time and a place where The Things In/Of the World must be discussed between parents and children and guidance in and of such matters given. But there is also plenty of time for that. Nine years of age wouldn't be my ideal. At that tender of an age, why not expose the child to characters of nobility and courage? (The Lion, the Witch and the Wardrobe seires or the Redwall series.) Why not light hearted humor? (Hank the Cowdog or any Beverly Cleary book.) Why not some "clean" mystery with a happier ending? (Bobbsy Twins, Nancy Drew, Hardy Boys, Trixie Belden.) Why not tales of imagination and friendship? (Charlotte's Web, The Wind in the Willows.) There are so many options for characters who lift the spirit and tell a story worth hearing. I would argue that the darkness of topic and content in the Series of Unfortunate Events series is not worthy of a child's time. It brings into play issues that they can wait on dealing with. During this time frame the idea shouldn't be to throw open the flood gates of "more adult matters" for thought and speculation. Instead this time frame should be used to build ideas, thoughts, beliefs and convictions in a child so that when they ARE forced to deal with these and other subject matters, they will have a firm foundation underneath them. I believe a Series of Unfortunate Events seeks to undermine the foundation and throw us all for a loop! This is a series that will definitely NOT be landing on any bookshelf in our house. I'm sorry there's shelf space for them anywhere. And I know of yet another Jim Carrey movie I can skip. Disgusting. I agree if they are making a movie about it with Jim Carrey it can't be any good to begin with. Unfortunately one needs to stick with "older" books or classics to have good reading. I loved Nancy Drew as a child, and they were considered "old" then!! I wouldn't say I really hated them, but yeah, I was very unimpressed for the same reasons. And I read a couple more in the series and it soon proved to have the same failing of most series, too: the same tedious plot, the same character gags. Over and over and over. The horror! I haven't read them either, but have wondered about them, and probably will read them before my eight year old gets drawn in. Hmmm. I saw the movie first and have no desire to go on and read any of the books. It was disturbing and books being more detailed I can just imagine. At 9 years old why would I want my child reading of children who are trying to escape the clutches of an uncle who is trying to do them harm & will stop at nothing to gain their wealth? Yuck! You're right, much better offerings from the classics. A couple things I thought I'd mention. I read an article/interview with the author. He mentions that he puts the words (definitions) in the book because children today have very poor vocabulary and it was his way of helping to strengthen it. I thought that was reasonable, though probably no less annoying than the morals of the McGuffy Readers. The other comment was that the author purposely points out the story will be depressing because he wants to push off anyone looking for a happy sappy story... though one has to go through all the books to get to the REAL end, I've been told. Having read nearly all of them with my husband and son, and gone to a book signing--and listened to the author and several interviews--I have to say I completely disagree. I think it is fabulous he includes definitions of words and explains sayings. It increases children's vocabulary in a fun way. I wonder if you like Harry Potter? Because so often I find these books demonized, yet Harry Potter--with Voldomort trying everything in his power to kill Harry, killing others in the mean time is OK? Olaf is pretty much like any other villain in books, not worse, not better. BTW, the author was not thrilled about Jim Carey playing Olaf either. Bleah! I hated the Lemony Snicket books. The subject matter didn't bother me so much as the writing. The two I read (the one I read and the one I gave up on, to be more accurate) had me wishing for the books to just be over. Here is a link you might like to read. I love Snicket whole-heartedly but know several people who don't, so I respect your opinion. sem - I can totally buy the author wishing to stregnthen children's vocabulary. That's something I can sympathize with. Annoying for adult readers though. But I suppose that was not his point. Mari - I DID like Harry Potter (in part). I've only read the first HP book. I'm trying to decide why this would be a contradiction though. HP takes a more clear stance on good and evil and although the topic of the book (the magic aspect) is and/or can be dark -- it wasn't as disturbing to me as the topics involved in Unfortunate Events. Erin - Thanks for the link! I have to agree with you on this book - and it was the only one of the series I read. I was very disturbed by the implied pedophilia, the cruelty to the children, the baby being dangled at a great height, etc. The story also left much to be desired, and to recommend it solely as a vehicle to boost a child's vocabulary seemed ridiculous - why not instead read Ivanhoe, Black Beauty, or King Solomon's Mines for building vocabulary AND a great story? I gave the rest of the series a pass and advised my children to look for better books, which they did. I find the line of reasoning laid out in this post totally bewildering. The author of the post hated the book because “the darkness of topic and content … is not worthy of a child's time” and “There were several themes and topics within this book that I thought were rather shockingly inappropriate for the age group (9-12).” Indeed, the series includes elements of death - including murder, treachery, villainy, deceit, and betrayal. But such elements are in fact standard fare for adolescent literature and characteristic means of conveying struggle between good and evil. The Series of Unfortunate Events books are not fundamentally different in their reliance such elements than many of the books cited as counterexamples of worthy literature. Come on - The Lion, the Witch and the Wardrobe?? Surely you remember that the witch is Satan, that her plan is to incite one brother to betray his siblings, then kill them all, then start a war to forever solidify her power over all that is good. Her most triumphal moment occurs when she uses her most special knife to sacrifice the most noble character in the book on a stone altar while two young girls watch from a nearby hiding place. Of course all this happens after the children are sent away from their mother because their city is being bombed during a horrible war. You decry books without happy endings, but recommend Charlotte's Web. Charlotte's Web? In the end of the book, THE SPIDER DIES! I cried when I read Charlotte's Web as a child, and it wasn’t because I was happy! The amusing thing about this type of criticism directed at the Series of Unfortunate Events books is that they contain no more despair than many other uplifting stories and no less hope than many other inspiring works. It’s the familiar formula of heroes confronted by seemingly impossible hardship brought to bear by evil forces, heroes barely escape one moment of adversity by exhibiting admirable and noble qualities, only to be confronted by still more hardship, and in the end goodness and nobility triumph over selfishness and evil. The main difference between Snicket’s series and many of these others is simply that he repeatedly claims that all is darkness, hopelessness, and despair in the story he is chronicling. It is left to the reader to recognize that the narrator is taking an extreme view that is not actually born out by the events of the story, where time and time again the orphans win battles in their struggle with Olaf. This is not some impossibly cryptic theme and it is not beyond the reach of the typical 10ish-year-old. Indeed, my seven-year-old did not seem to have difficulty noticing that the Baudelaires keep winning (at least temporarily). They do this by relying on each other’s abilities, working together, and always trying to do the right thing. The author does not pretend that it is always easy even to identify the “right thing”, let alone to do it in difficult circumstances, and his characters have to work to develop this sense. Throughout, the heroes exhibit the kind of tremendous “imagination and friendship“ many of us hope our children will try to emulate. You want “characters of nobility and courage“? Can you (or perhaps someone who has read more than the first of the thirteen book series) explain how the Baudelaires do not fit into this category? You ask, “Why not light hearted humor?” This is of course entirely subjective, but my family found abundant humor of many shades of light-heatedness. “Why not some ‘clean’ mystery with a happier ending?” I see your point about the marriage scene, but I don’t think it was meant to convey a sexual aspect. Regarding the happiness of the first book’s ending, my recollection is that the siblings expose the villain, foil his evil plot, rescue their little sister from mortal danger, and take their first significant steps in solving the intricate mystery of their family‘s past. Regarding the happiness of the end of the series, I suppose that should be left alone for those who might still want to see for themselves. I will only say that I found it both inspiring and touching, and I believe it also contains a message for many people who will unfortunately never read that far. I really don’t mean to try to convince people to read a book that they do not think they will like, or to read the rest of a series after hating the first book or two. I do, however, want to let anyone who reads the above criticism know that there are also people who find that the Series of Unfortunate Events does “lift the spirit and tell a story worth hearing”. Furthermore, I can’t imagine what foundation it is meant to have undermined, and I believe that these books can build great “ideas, thoughts, beliefs and convictions in a child” that they may well find useful in the present as well as the future as they deal with their own minor villains and tragedies. And if we don’t insist on only reading books without unfamiliar vocabulary, we as well as our children might even learn a few new words along the way. There is not real violence either--unlike in Harry Potter. In the Series books, people just "dissappear". In HP, they are killed after a confrontation. I meant the HP books get darker, not the Series books. Very helpful to read your review and the comments! Thank you! I was totally turned off by the movie trailers - it isn't my kind of a movie and my son is only four so it was not an issue. But I have wondered about the series for when he is older. Thank you so much for your opinion - I think I will try to steer my son away from them. YAY! I appreciated your comments very much. They made me think. I still disagree with you, but appreciate the challenge. For the record, I don't have a problem with "darker" themes in children's books. I like clear distinctions between good and evil. I think Lewis does this masterfully in the Narnia series. I thought Rowling did this pretty well in the Potter book that I read. (BTW, I didn't read any further HP books because I knew they got darker and I just personally don't care to let myself dwell on that to the degree that I knew Rowling would force me to. Narnia and Potter are really quite different in my head and I've never gotten into the comparison arguments.) I'm not saying, for the record, that I wouldn't read further into the Potter series -- because I might! I'm just saying that I'm not in a place now where I care to. I did find the first book inventive and imaginative. A well-told story. What I said in my post was that there were definitely topics that I thought were extremely inappropriate for children (specifically, the idea of a 14 year old being forced to marry an old man and the random subject of polygamy). I also told you why. I worked in a District Attorney's office for a time. I saw stories like that -- REAL stories -- first hand. I wouldn't wish for any child to be confronted with such disgusting issues at so young an age. I'm definitely sensitive towards THAT type of evil. It's ugly and not worth having a 9 year old dwell on. I have no problems with the subject of death. That's part of life. I also have no problems with the topic of hopelessness, darkness or even dispair. I do have a problem when good doesn't conquer evil in the end. Not momentarily - but finally. Therein lies the difference between this series and Narnia. I can't speak for Potter (obviously). This should hint to you as to my theological view point. Good conquers evil. I like stories that result in the same. Because I believe that's the end. Also, you mentioned my listing of Charlotte's Web. I listed that under the "imagination" catagory (animals talking) and "friendship" (of which I don't think it can be argued that it is NOT a book about friendship. As for constantly giving the definition of words...I am NOT saying that stretching vocabulary is a bad thing. I'm saying that I found the way in which it was done was obnoxious. Children these days DO suffer from a limited and sometimes bad vocabulary. Tools which can stretch and improve are to be welcomed. I just didn't happen to find Snickett's method particularly endearing...although I can see his point. What a shame! I've also heard lots of good things about this book, but wasn't too sure about it myself, especialy after seeing the trailer to the movie. It's disgusting all the junk society permits in childrens literature and entertainment. The post and comments were enlightening and informative! Wow--I saw how many comments had been made since my visit, so I wanted to read them, and you generated a lot of chatter. I will say that I have read through book 4 of HP, and they do get darker (4 and increasingly as you go, I think--I have 5 waiting), so far I have found nothing objectionable for me as an adult reader to dwell on. I would also love to share them with Amanda when I think she's ready, if she'd like. However, I do want to get to the end, because she's such a fast and avid reader, that once she begins the books, I can see how she could completely finish the series within a couple of months.